I didn't even know that people put jellyfish in tanks like that. It's very cool and outer space spooky looking. I love it. The substrate is there specifically to keep the water flow partially obstructed so the jellyfish don't get sucked into it. Some models have a sort of grate over the intake to serve that function, but this one just has it open and they give you bags of substrate to cover it up. One week in -- one jellyfish perished of some bizarre jellyfish wasting disease (it just quickly shrank until there was nothing left). Other two seem fine, so whatever it was doesn't seem to have been contagious. One is very active and fun to watch as it jets around, the other appears to be comatose and just drifts in circles without exerting any effort (it doesn't seem to be withering or injured, though, and I can see food ending up in its stomach at feeding time, so I'm pretty sure it's alive and healthy). So Gary, my Koi Betta went MIA today. 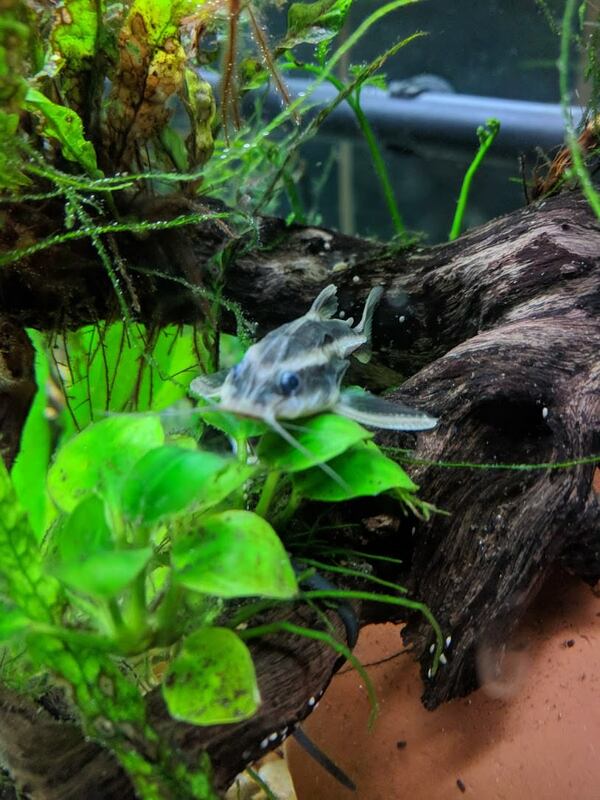 I took all the big items out of his tank thinking he was stuck in the plants or something... nope. Fucker jumped out. I found him under the radiator over by the window, 3 ft from the tank. He was full of dust and crap from the floor and dried out. 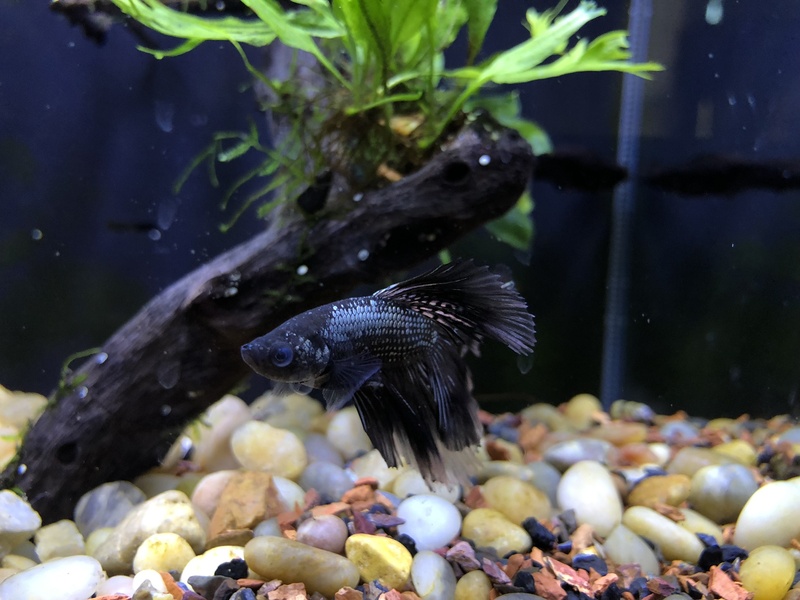 As a send off, I cleaned him up for his funeral but on the off chance I could maybe see if he has anything in him, I put his body in a small glass dish with about an inch of water. Rinsed him off, and dumped the dirty water and put his tank water in the dish and left his body while I cleaned up his tank. It was about 2 hours between me seeing him in his tank and finding him under the radiator so I have no idea how long he was out of the tank. Either way, I am cleaning his tank when I notice he is not on his side that I had him on after I cleaned him up. So I grabbed the dish and as I am looking, his body twitched. Almost dropped the dish. I rubbed his side and he started thrashing around. So now I am on Lazarus watch... 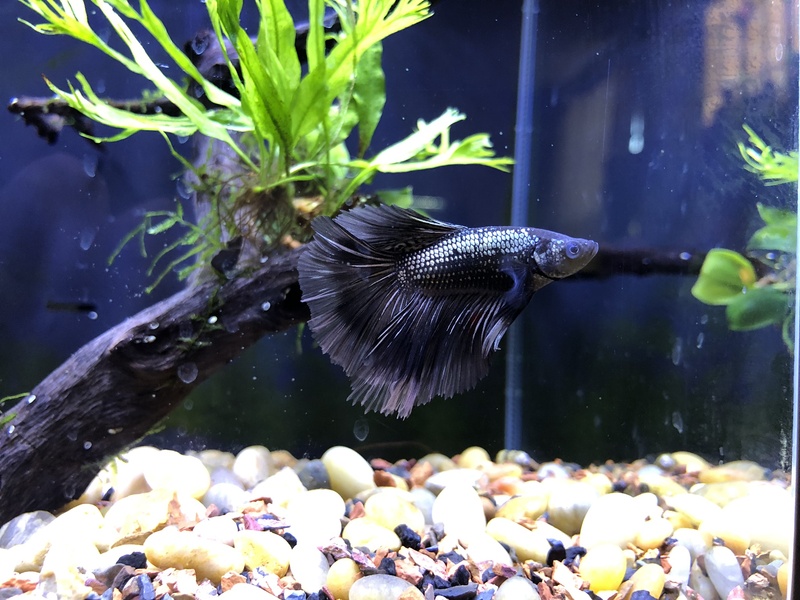 If he survives, it'll be a miracle but right now, he is taking gulps of air and swimming for a few seconds before going catatonic whenever I change his water (with an eyedropper). Glad I remembered they are puddle fish and thought he might have a chance if he got into water again... just hope he didn't damage his swim bladder. So Gary never made it and I completely forgot I wrote that piece earlier. In other news, finally found a striped raphael at the LFS. Good inspiration in this thread. I started my planted tank a couple of months ago, with a "dry" start. 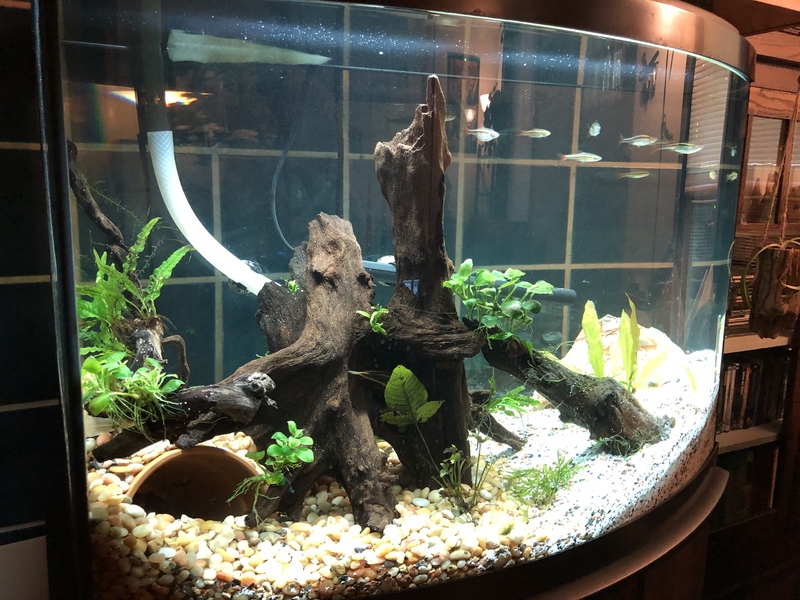 Here's how it looked after I got it going with more plants and some fish. (Now I'm dealing with some brown algae, sigh). More plants to come, once this algae issue resolves itself! Viin, you're running CO2 I hope? And lots of light? Those are some tough plants you've got there! My tank is too big to realistically do CO2, alas. Got lots of light and trying Excel every other day - might up that to every day if I don't see some perking up soon. For a 12G I was hoping to skip any real CO2 system... few more weeks should tell the tale. You will need fertilizers, with those red stem plants. Light is like stepping on the gas pedal, it makes everything try to grow faster. Algae doesn't need much more than light and trace nutrients. Plants need N, P and K, and CO2. If you don't have enough fertilizers, the algae will win when you add light. Stem plants in particular, and especially those redder ones, need N, P, K, plus trace minerals -- iron especially, that's what makes them red. FWIW, I dose Excel every day. Good info, I also have Flourish which I've been doing every ~4 days. I haven't tried any iron fertilizer yet (but I do have a bottle), though I have noticed the red plants are turning a bit green. The problem with fish tanks is that there is no 'sink' for excess minerals etc. Phosphate is a delicate one to balance for this reason. Having a tank with live plants takes a level of care and dedication that I haven't reached yet. I'm REALLY impressed by both of your tanks. They put mine to shame. The standard way to deal with planted tanks these days is called the Estimative Index method. Basically, you over-fertilize. It doesn't hurt the fish. You then do substantial water changes on a regular basis to take out the excess fertilizers from the water column. EI experimentation has shown that most algaes are because of a LACK of all ferts being in the water. If you have plenty of nitrogen, and not enough of the other two, plants suffer but nitrogen-specific algae flourish. And so on. So what EI does is make sure there's an excess of ALL of them. Note that EI (and lower dose versions, such as PPS) calls for high doses of nitrogen, potassium, and phosphate, plus doses of micronutrients, which is what "Flourish" (the one with no other name) is. If you dose only Flourish you're basically giving vitamins without giving fats, carbs, and protein. The more light, the faster stuff tries to grow. The more food it will need. It can only eat as fast as it "breathes" which is why you then also need to dose CO2 (or Flourish Excel, which is liquid CO2). If you add ferts and don't add CO2, stuff just can't grow as fast. "Hard" plants call for a lot of something -- lots of ferts, or lots of light. Pretty much all stem plants are at least medium difficulty, and all the red ones are medium to hard. The really hard ones have weird biological cycles like bulb plants that have to be removed from the water sometimes, or plants that have really specific "vitamin" needs in terms of ferts. Calling for a lot of any one thing means you then need a lot of everything, if that makes sense. That's why adding light without adding the rest causes the tank to explode in algae. Flourish Nitrogen, Flourish Phosphate, Flourish Potassium. Plain Flourish: "vitamins" aka micronutrients. Includes small amounts of iron. Flourish Iron: added iron for red plants. But it costs a fortune. Which is why you move to buying this stuff by the pound as dry powder and mixing your own bottles of the liquids. It's literally a fraction of the price. EI for my 80g tank with dry ferts is 1/4 teaspoon of P and K and 3/4 teaspoons of N, every other day; 1/4 teaspoon of traces (I use CSM+B) on the alternating days. Excel, one large capful (I use the gallon jugs and their caps) every day. I check total dissolved solids and let that drive water changes, which I do from the tap. I can get away with monthly. I top off evaporation with RO/DI water. Thanks for the info, especially the link above! Agreed. Great stuff. Thanks Raph. Man I keep the most durable plants I find and spend $$ on the fish. I keep the plants in pots and the fish in tanks. You people and your aquascaping. Raph, do you know if I can premix the various Flourish ferts to make the right ratio for regular dosing? That way I don't have to measure out tiny amounts of each every time I go to dose .. I'm pretty sure it's fine. But don't keep it in sunlight (once liquid, it molds easily) and don't mix in the traces (iron and Flourish Comprehensive). The reason you dose the comprehensive on alternating days is because it reacts with the others, and precipitates out as a salt or something. You are full of useful links! 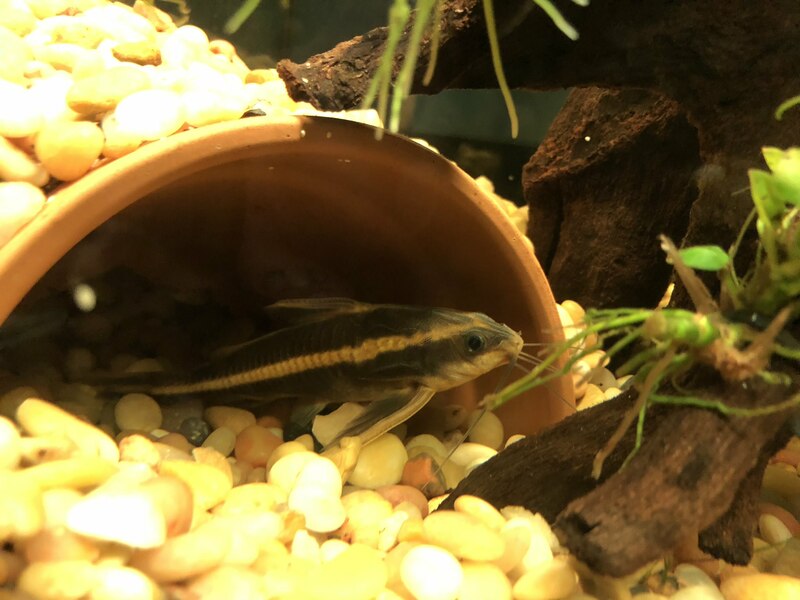 Found a nice piece of drift wood in the LFS and had to get it... Creature took to lurking under it almost immediately. Just in time for the holidays. If anyone is in the States and looking to get a nice tank, Petsmart has some amaz-balls black friday sale: 60gal tank, stand, glass cover and LED lighting for $125. 4' x 1' foot print. If I wasn't renting, I'd grab one. Wife named him Chester because he's a copper strain. Can't really see it, but he has a very pretty rust colored underside.